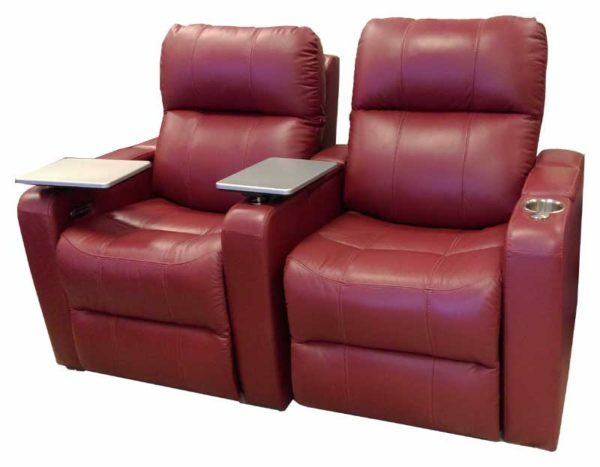 Featuring a power headrest with an extensive range of travel and a seamless power reclining function, the Soundtrack collection of home theatre seating offers the epitome of comfort and flexibility. A modern track arm with integrated storage finishes the design, providing the perfect place for keeping your belongings organized and within reach. The Soundtrack collection features ultra-plush back cushions that are pillow soft and will embrace you with warmth and comfort. The bucket style, high-resiliency seat foam provides comfort and support whether sitting or reclining that lasts for years to come. A multitude of straight, curved or combination configurations will suit any space and you can set up as many rows as needed to distinguish the lounging ambience for any occasion. As if these features were not enough, the Soundtrack is compatible with a variety of accessories, all designed to enhance functionality and keep up with the demands of a highly functional space.